First published at The Freeman and posted here with the kind permission of Dr. Yandle. On May 14, 2013, Washington was much astir over the news that the IRS had deliberately targeted Tea Party groups for deeper investigation and justification prior to approving applications for non-tax status. If in fact IRS personnel engaged in the kind of practices that have been reported on and were intentionally targeting conservative groups, then that’s outrageous. And there’s no place for it. And they have to be held fully accountable. Because the IRS as an independent agency requires absolute integrity, and people have to have confidence that they’re … applying the laws in a nonpartisan way. The President said what most people were thinking, but his comment about IRS independence came as shock to Washington insiders. 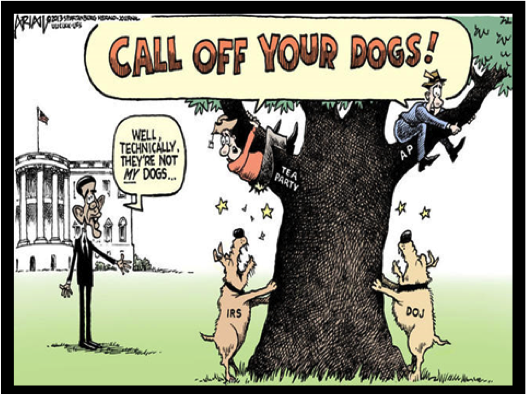 President Obama expressed shock that government agencies would ever operate systematically to punish the enemies or reward the friends of sitting presidents. But students of Public Choice, that discipline that uses economic logic to explain political action, were not surprised at all. And why should they be? Public Choice studies tell us that all government action is best seen as political. All of it. Special-interest influence seeps through in unusual but systematic ways. And it doesn’t take written orders from the top or telephone calls from the oval office to make these things happen. People in politics understand the game; they know which side of the bread receives butter. On the IRS specifically, Jim Couch and colleagues at the University of North Alabama published research in 1999 that focused on statistical treatment of IRS audit activities as conditioned by political variables. The 1995 audit data were part of annual summaries for IRS districts reported in the Transactional Records Access Clearinghouse (TRAC) at Syracuse University. The Couch et al. statistical model explained the frequency of those audits across states. 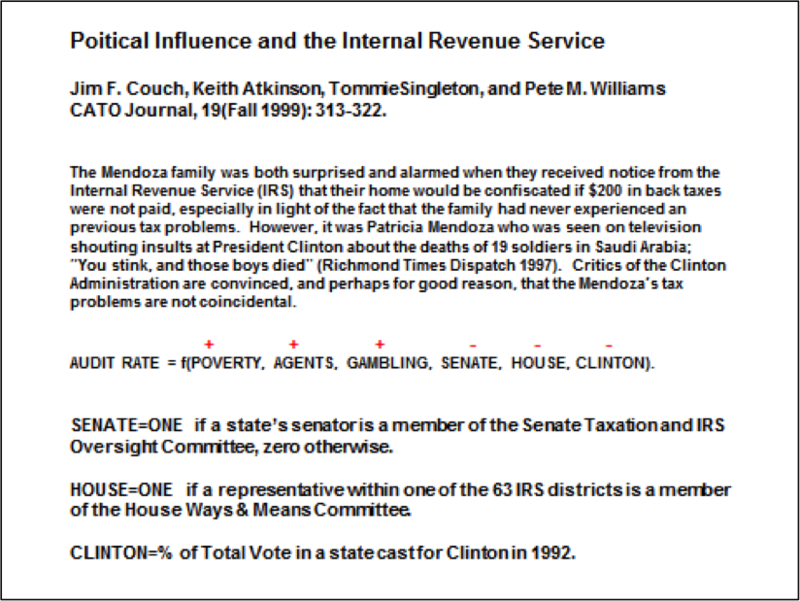 Their explanatory variable included whether or not a state senator sat on the IRS senate oversight committee or a representative sat on the house oversight group, the share of votes cast for President Clinton in 1992, and other variables that are thought to be positively associated with audit activity, such as higher levels of earned income tax credits as proxied by the state poverty rate and gambling income. A direct quote from and summary of the work and findings are shown below. As indicated by the plus and minus signs over variables, audit rates fell when senators or congressmen sat on IRS oversight committees. They fell when a larger share of a state population voted for Bill Clinton and rose for those states with a poor Clinton record. More agents in a state and more gambling mean more audits, as does a higher share of poverty. In short, politics seems to matter in explaining IRS audit behavior. These statistical results parallel others that have focused on federal antitrust activity, presidential declarations of national disasters (actions that trigger a flood of federal support), decisions to send combat troops to the front lines in the Vietnam War, and even where Chrysler dealerships would most likely be canceled when the federal government called the shots during Chrysler’s 2009 reorganization. The antitrust study shows that, all else equal, actions are taken less frequently against firms headquartered in the states and districts of congressmen who sit on antitrust agency oversight committees. The national disaster study examined FEMA activity, adjusted for severity of disasters, state population, and other variables. The researchers found greater frequency of disaster declarations for politically important states than for others. The authors reported that some 45 percent of FEMA actions were motivated by politics instead of by disaster severity. The Vietnam study showed the seniority of a state’s House and Senate delegation matters. Higher seniority meant lower troop death rates. The study also found that the stronger a state’s linkage to defense industry contracts, the less likely it was that troop units from that state would experience casualties. And the Chrysler study found that the state share of dealerships closed was smaller in states that provided stronger support for Obama’s election, but larger otherwise. These Public Choice statistical findings suggest two things. First, all human beings respond to incentives, even politicians, whether they are supplying houses, food, or politically determined actions. Second, since this is common knowledge, we must take action to reduce occurrences that corrupt the political process. But how? First, by limiting the domain of government action. Then, when the domain is limited, by requiring transparency and regular agency reports that demonstrate choice neutrality, by encouraging competition from the loyal opposition, and by showing constant vigilance. Dr. Yandle is Dean Emeritus of Clemson University’s College of Business & Behavioral Science and Alumni Distinguished Professor of Economics Emeritus at Clemson. He is a Distinguished Adjunct Professor of Economics at the Mercatus Center, a faculty member with George Mason University’s Capitol Hill Campus, and a Senior Fellow Emeritus with the Property and Environment Research Center (PERC).